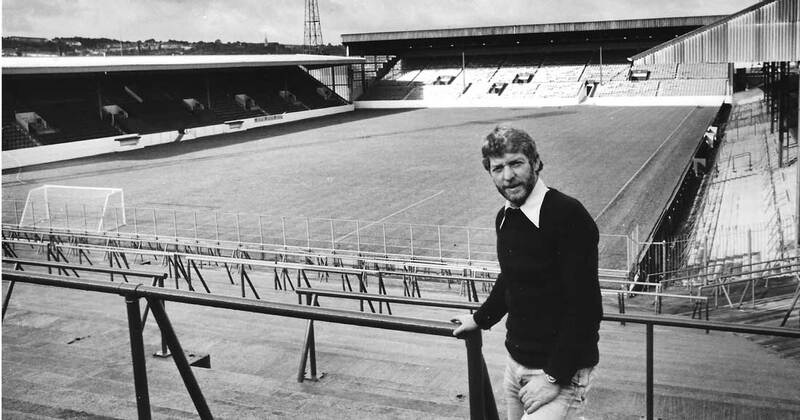 Through the 70s and 80s he worked in all weathers, 12 months a year, often thanklessly, mostly scrimping and scraping trying to make ends meet because the club was so hard up, but by general agreement amongst players and referees he produced one of the best football pitches in whatever division Burnley happened to be. He was Roy Oldfield, not a name that too many supporters would have known but they saw the results of his labours every week through the football season and unless the weather was horrendous he never failed to have a pitch ready for a game. The old legend, Burnley chairman Bob Lord, first employed him in the early 70s after Jimmy Adamson had plucked him from Scott Park in Burnley where he was a gardener. Before that he had worked down the mines for 16 years. “Come and see me when you finish today, I might have a job for you,” said Adamson. Roy thought he meant a gardening job at his home near the park. But no it was a job at Turf Moor to assist and eventually take over from John Jameson. Roy met Lord and remembers to this day how eagleeyed he was when they first met and Roy showed him, as instructed, a payslip including the overtime that Roy hoped he wouldn’t notice. As Roy Left, Lord called him back. “I see that payslip includes overtime, but we can match that all right,” he said with the hint of the smallest grin. Roy won’t hear a bad word said about Lord whom he describes as a fair man to work for if you did your job to his satisfaction. And old Bob was satisfied with Roy’s work and loved nothing more than to stand at the top of the Bob Lord Stand stairs, arms folded, watching Roy work on the green grass. There was a break of a couple of years in the mid-seventies but Roy then remained until 1990 and during those years he met top players and managers and accumulated a wealth of memories and stories that form the basis of the new Burnley FC book, Mud, Sweat and Shears, a wonderful collection of tales of the Turf through the eyes of a groundsman. And what years they were. During his time at Scott Park Roy had read up on things and gained several qualifications but on arriving at Turf Moor John Jameson, in the nicest possible way, told Roy to forget all that. He pointed up at the sky. “That’s your problem,” and Roy knew immediately what he meant – the weather. For the next 16 years as groundsman that was true enough, whether it was torrential rain and flooded pitches, or winter blizzards and tons of snow to remove. But John never mentioned the pigeons; Roy learned about those from experience. 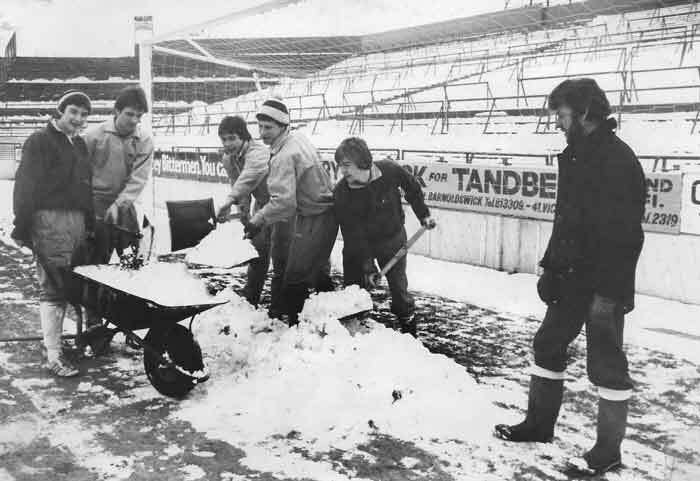 When it was time to re-seed the pitch at the end of a season dozens of them would line up on the roof of the Bob Lord Stand and patiently wait for Roy to finish and leave. And then down they came. It drove Roy mad. Even the fireworks that went off at intervals didn’t deter them. They simply learned and waited for the last firework to explode and then swooped down again. He had a rough rule of thumb that he had learned from the Liverpool groundsman, Arthur Riley; use three times more seed than you think you need. A third won’t germinate, a third will feed the pigeons and that leaves a third that will grow. 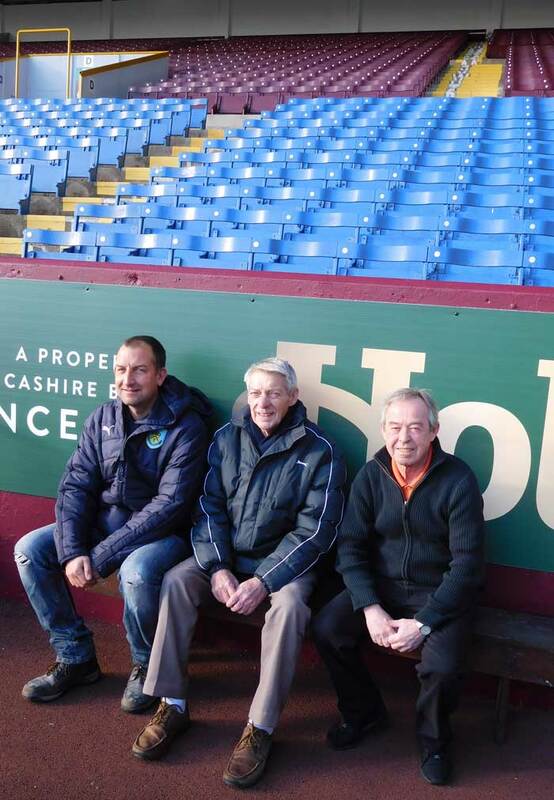 Roy marvelled at the current Turf Moor pitch when Paul Bradshaw showed us round. Paul as a schoolboy had once worked for Roy in the summer holidays on work experience. Life produces some nice stories. Paul is now there as Head Groundsman. The pitch now is as good as indestructible no matter what the weather. With undersoil heating, better drainage and a Desso surface, plus seed that germinates all year and moveable gantries of artificial sunlight, plus machinery that Roy could only dream about, the pitch today is a dream to play on. When winger Steve Kindon with his boots the size of a small boat went into one of his infamous slides in Roy’s day, the gouge could be inches deep and ten yards long. It would take Roy and the apprentices, working into the night, and the following day, hours to repair a pitch after a game. Now it takes a fraction of that time. If asked about what disasters might befall him, Roy could have filled a chapter. When I asked Paul he struggled to think of one other than the sprinklers jamming when switched on. While Roy had a host of prematch duties involving the dressing rooms, meeting the referee and distributing complementary tickets, Paul has one focus – the pitch. "If only I'd had this 30 years ago"
The list of managers that Roy worked with is a who’s who of Burnley history; Harry Potts, Jimmy Adamson, Brian Miller, John Bond, Martin Buchan and Frank Casper were among them. Among visiting managers he still remembers the day Brian Clough turned up quite out of the blue. chips. Next, relates Roy, was one of the best half hours he spent as they chatted and waited for the Turf Moor management to return. up like cowboys. The cattle or sheep were always herded into a pen for the farmer who was made to ask for permission by Bob Lord to retrieve them; and how Bob Lord used to love to pick a carnation from the greenhouse there for his buttonhole. Although there was a promotion in 1981/82, the 80s were turbulent times at Turf Moor but Roy soldiered on with the most minimal of resources. The joy of that promotion was shortlived and as gates dwindled and finances shrivelled it’s almost true to say that Roy had little more than a mower, a wheelbarrow and a couple of forks. He thought it was his birthday when the Supporters Club donated a new wheelbarrow. He thought it was Christmas when he found a sack of fertiliser he had forgotten about. There were real fears that the club would fold at the end of the 1985/86 season, the situation so desperate that extra souvenir, ‘in memoriam’ programmes were printed for the final home game. But it was the following season when the memorable ‘Orient game’ was played on the very last day when there were unparalleled fears. Lose and they exited the Football League. He remembers the tension, the fear and apprehension, the crowds, and the bear hug from manager Miller that nearly crushed his ribs when they won and survived. He watched from his little brown bench by the players’ tunnel, the bench where he’d sat and seen every game since he started. 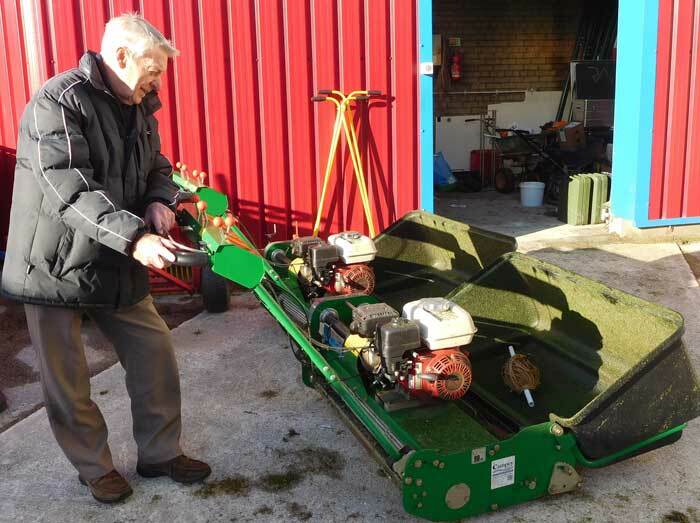 By the end of the decade he decided to call it a day at Turf Moor and accepted the job of groundsman at the ambitious but illfated Burnley Bank Hall Football Club. There he found better equipment and even a better salary. How ironic that he now worked directly above the old abandoned Bank Hall Pit where he had worked underground 20 years earlier. Life works in funny ways. Roy’s unique story, Mud, Sweat and Shears, by Dave Thomas will be released in June, published by Pitch. It will be the only book about football through the eyes of a groundsman.